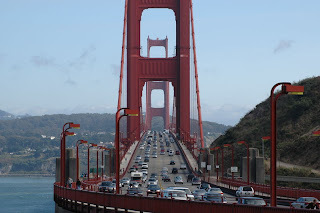 Or, a trip across the Golden Gate Bridge. They are proposing a hike of $2.00 in the bridge's toll for morning and evening commuters and on weekend and holiday afternoons. In other words, peak travel times will cost you more. Well, that's one way to deal with congestion. Price it out of the market. I'm glad I don't own a car. My heavens darling is that all 7.00 buys, how times have changed, when I was young and working at the Triangle Shirtwaist factory that was my wage for the whole month.